Our newest hack for Glu's Kylie & Kendall Android mobile game has just arrived and if you're a fan of the girls then you should get it now! It has glamour, fame, and even its own little social network, the game that is.. read on! 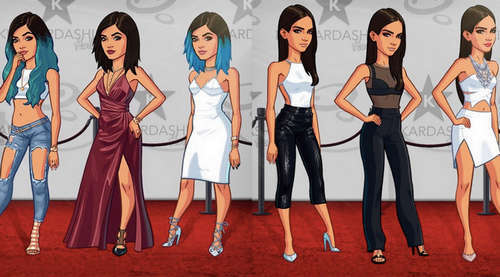 Features in KENDALL & KYLIE Modded Apk include unlimited K-gems & money with energy and max level. Considering how much real cash it might be required to progress through the game buying upgrades and such, this mod is a must download! The game has you create and customize a character then move to Santa Monica in pursuit of internet fame. You keep tapping on things, as Kylie Jenner of course, and meeting new people, all to gain unlimited followers on social media in hopes of going viral. Your decisions in conversations influence the story so play smart! - Admission to the "100 Club"
- In-game Kylie Jenner meeting the avatar designed by IRL Kylie. Use "Advanced Download Manager" to dwnload the game at full speed without errors! Install the apk, Extract OBB data folder "com.glu.kandk" into sdcard (device storage) Android/obb/ , and play. No Root is needed for Normal apk, But UnSigned version (can be requested - to connect to Google, etc) needs Root to disable .apk Signature Verfication using LP! Latest Update: Kendall & Kylie 2.8.0 is the latest version officially released on March 21, 2017 - uploaded on Google Drive, If you need Zippyshare Mirror just say so, enjoy! Q. How to solve Facebook sign-in errors? A. If you have Facebook app on device uninstall it, then open the game and log in to Facebook, and then install FB again. EDIT: If that doesn't work, you may need Root + UnSigned version to use FB from now on, probably! Q. Can I keep saved game progress after update if I already have a previous mod installed? A. If you've installed v1.0.1 from us then go to "android/data" on your phone, rename "com.glu.kandk" to "com.glu.kandkx", install the updated .apk then revert the file back to its original name. Q. How to fix "The game was unable to find my saved game" error? A. Close game then open it again, it should work. More tips in user comments! Here is MAX LEVEL VERSION if you need it and for those who requested it in comments, It includes all other cheats too! Anti-ban Untested! please hold on for a few hours! it's up, see comment below for the link! added link in the post above so u can click it to download! Hey, downloaded this apk successfully following the link you provided in a previous comment. Installed ok, playing ok. So far so good. Thanks. u need to download update above if the game asks you to update! KENDALL & KYLIE Max level has more ban risk, but i'll be uploading it in a few hours! thanks for letting me know i'll check it out! v1.0.2 is the latest update! download it from the provided link, and install! send request via contact form, then ill send u the link! i wont put it on here kuz it'll get reported then deleted then ill lose my GD account! i dont have that specific tablet so google is your best friend! Can i have the google mirror link? The other link just spams my phone with virusy popups. Also if i download this file, it will just work? First download the game from playstore, start a game and log into facebook. Delete the app and install the mod apk, click use saved game - log into fb and continue. I did what you said and the game still wont start up. The screen goes to black and then it kicks me to the home screen again. what details are u talking about? I already stated that there is a ban risk, so use the mods moderately or you'll get Banned by Glu! I hope that doesn't happen though, but you've been warned XD use at ur own risk! Even when i finished my goal,it was still on my goal list and some goals are multiplied so i can't have new goals and also text .what should i do? read comments on the Play Store! the official game still has bugs on some devices! the mod has been tested by many users and works fine! u can wait for an update if you cant play this one! link to Kendal & Kylie 1.1.2 update is included above! it says the hardware doesn't support the application???? 2. Play it a little bit and then close it and uninstall it. 2. install our mod apk and play! I click the download link, but it always sends me to a page that says I can claim a free prize. How do I fix this? Ryan, I am currently trying to install the Hack on the app, but I am unsure how to do it. So I was just wondering whats the steps to installing it on the phone from the computer? or send the apk file to phone using bluetooth. 3. Go to where you tansfered the apk on your phone and install it normally. 4. open the game and have fun! 1 Quick Question, Once I copy and paste the APK file to the phone, and reinstall the game. Is there something else that needs to be done to make it work because I don't see the APK file anywhere on the phone other then the game that I reinstalled. Also, I did have to remake the character once I reinstalled because I was not signed into facebook or google unless you have to do that once you add the APK file. u may have misunderdstood me or me you! u need to install "KENDALL_KYLIE_v1.3.01_mod.apk" u downloaded from the link in the post above. If u've installed the previous version from Apktron then u can overwrite (install the new one directly without uninstalling previous version)? Why does it keep saying "Loading Save Data"?? Can I have a copy for root apk of this? Question: I downloaded the app from Herr but when I went to play it,none of the challenges worked where I needed energy. I uninstalled the hack and reinstalled the hack version but its giving me all the perks of the hack. Is this safe? It didn't revert my game back to what it was before the hack. antiban is implemented but cant guarantee safety.. no one here has been banned so far.. just play smart! Thanks and I meant to say the little boxes that you click on in missions don't work unless I open the game from the play store app but it is the apk game I'm playing cos it says this game has been "yada yada" by... I just don't want to get in trouble legally, not worried about "glu" banning me, they are already robbing people. Stuff is expensive to buy, I had already bought stuff. Thanks. What's the link again ? Update 1.4 is out can u make the apk im scared of updating with another apk or googleplay for fear itll erase my progress or unlimited money and gems. I've just uploaded version 1.4.0 (it has a separate data (obb) folder unlike previous versions). Just install the apk, move data folder into internal sdcard /Android/obb/ , and then run the game and play. Tried downloading the updated one but when i do it keeps saying cannot open file for both of them. Help ? you need to unpack the archive using 7zipper or Rar for android or other program on desktop! install apk, and place data folder into /android/obb/ , then play! I did that and every time i try to play it , it crashes and says "unfortunately, kendall and kylie has stopped"
im trying to download this for my iphone using bluestacks but it keeps on closing on the bluestacks app. any help? havent tried v1.4.0 on bluestacks yet! will check it out! no android is fine, but computer is more practical since popup ads (adfly, Zippyshare) can be annoying on a phone. what is the link to your update? thanks! i dont have a mac so Google is your best friend! sorry! 3. Play and have fun! [UnSigned APK - Root Only] = IN CASE YOU GET SIGNATURE ERROR!! I downloaded the 2.0 version wouldn't work so I uninstalled it. I did all of the android obb thing now it wont even download. Help!!!! nivel maximo pero mi celular dice que no existe!que puedo hacer? This doesn't work. Idk if I'm doing something wrong but I don't have unlimited anything. Could you maybe explain a bit better? I downloaded the apk..Im pretty sure I moved the files into the right spot..but nothing happens when I load the game. Please help! anyways a better version is on the way! ETA tomorrow! u should use our new apk and obb file to play using unlimited stuff! I have a question. I am not able to instal the mod because its 124mb google Drive says that the document is to Big to check on virusses. My question is if there is an other wat to download such a big file onto my phone? it's a normal message GDrive has for all big files!! DO NOT WORRY, the file is safe, just click "Download Anyway"
I chose GDrive because it's fast and resumable! I did all the steps correctly, but it isn't working. I'm using a Kindle Fire and I'm logged into Facebook. What do I need to do to make it work? does it start and crash? whats the problem exactly? the procedure is fairly easy! search google and let me know so i can give you the UnSigned Kendall apk. then install the apk and obb! HI so like can you please just step one by one with me. I just want the inifnite gems and stuff so like I do not want the unsigned version. I don't understand what you meant by Put the Data folder or whatever. LIke where do I locate the data folder? Can you please go slow with me cause I do not understand anything lol. the instruction is pretty clear and easy! u just need 7zipper or Rar for android to unpack the archive and get the apk and obb folder! hi! im using bluestacks, so i have to ask, where is the android/obb thing on the pc? thanks! It says "App Not Installed"
How can I update to the new version with antiban? Hey I tried the hack, I did everything I was supposed to and every time I try and open the app it stops and says unfortunately, kendall and kylie has stopped.. What do I do? does it work on android 6.0.1 ? i already downloaded the apk but every time i try to open the game it crashed and says " unfortunately, kendall and kylie has stopped " do you know how to fix this? i just finished the v2.4.0 mod then found a bug, now fixing it!! the upload may take a while, slow internet around here! Is there a way to get the past event items added to youre closet cause i really want some of the older things. the game closes when i click it, what's that? i've tested the game on mobile and it works fine!! Hi, I need a Google Drive version please. My max level version keeps on stopping what do I do to fix it? Max level for 2.5.0 update? Im having the same issue. It won't work. Google Drive link tested working ok!! Hi. I opened the app and it closed immediately. Is there a problem? Where's the link for the mod apk? uninstall everything and do it again!